Looks a really good price but be quick only 7 left.Looks to normally retail around £150.Winner of Mother & Baby Best Buy, Prima Baby Best Value, Bambino Goodies Hot Buy, Bambino Goodies Buy it awards. Shopping basket and raincover included. Easy compact two hand flat fold. Folded size (L)76, (W)42, (D)37cm. Compatible with the following car seats- Petite Star Ali Handle Car Seat (adaptors inc with stroller), Maxi-Cosi Car Seat (adaptors available separately). Complies with the BS EN1888. 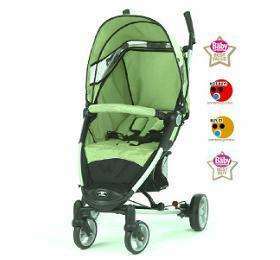 Its the lighter stroller I've used and folds/unfolds easily. It does feel a bit flimsy but actually held up very well. The only reason we changed strollers in the end was because it just doesn't sit un straight enough for a toddler - they end up holding onto sides pulling themselves forward to get a better view. My dd was very comfy in this as a newborn and baby though and it was very easy to push. Just looked at a site recommended by a forum, you can win a bottle of bubbly if you review it on totadvisor. I've one of these for 6 months now and its great - super light and can be folded with one hand. This is Ideal for small cars as I bought to fit in my Mini.